Janet Rudolph offers a comprehensive list of Labor Union-related mysteries for your post-Labor Day reading. Crimespace fan? You might want to check out the ongoing discussion about crime novels that have pushed the envelope into literary territory. Don’t be afraid to chime in! The Millions has a post earlier from Kim Wright about nearly the exact opposite–literary writers who have turned to genre fiction. Speaking of The Millions, here’s Michael Bourne’s review of George Pelecanos’s THE CUT in case you missed it last Wednesday. A new international trailer for DRIVE, based on the James Sallis novel, is up with new content. Plenty more where that came from. 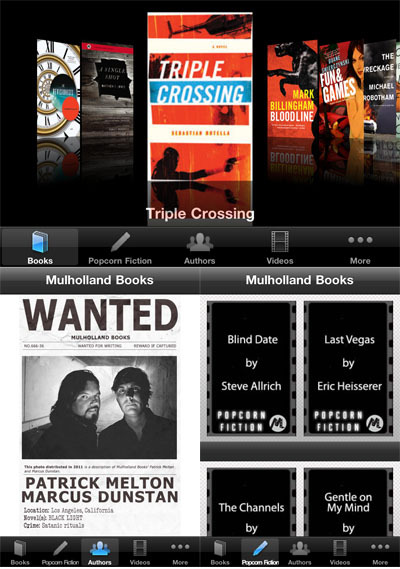 In Mulholland Books news, THE MULHOLLAND BOOKS APP HAS ARRIVED! Download it for free now. And in some of the great reviews of Mulholland books this week, Thomas Mullen’s THE REVISIONISTS received a starred Library Journal review, Jedediah Ayres has high praise for Matthew F. Jones’s A SINGLE SHOT in the B&N Ransom Notes blog, and a blogger crosses genres to find out A SINGLE SHOT is of her favorites of the year.